Unbelievable to think that it is already August of 2013. The dogs days of summer are heavily upon us in here in South Alabama, and we are all looking forward to cooler weather. In the meantime, I am thankful for the blessings of life all around me. . .
Swallow-tail Kite above our pasture. Beautiful creatures. Mama Doe in our pasture at the same time! Cooper and his Granddaddy getting a little fishing in at the lake. My pensive Abbey enjoying her time outside. A view from the bank of the lake. Before you turn your nose up like I do at hot dogs, you gotta know these are at least healthier than most and really were quite good! Dragonfly on top of the bobber! Hannah and Abbey, hot and tired, but happy! Some of my favorite subjects to photograph--tree trunks! Proof of life in the lake! I found a perfect marshmallow roasting limb (at least in theory). The actual roasting process was a little less than successful. The beautiful end to a very beautiful first day of August! 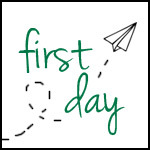 Click the First Day button above to see how others captured their own First Days in pictures! Hi April! I am visiting from Elizabeth's blog. Hope you enjoyed your 'first day'. And so nice to meet you and your family. PS I am a rabid coffee lover myself (ie Starbucks) and a Nana. We have a few things in common, that's for sure! Beautiful pictures! I especially love the sunset and the swallow-tail kite!